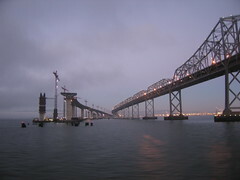 Both Bay Bridges, old and under construction. I have the mad urge to try to turn it into an LJ icon, if it looks decent at 100x100: would this be okay with you? Of course! Higher res images are on FLickr as always. I CC license all my images so there's no need to ask!